If you need a quick way to access the Internet a Netbook can be a great solution. They are lightweight and fast and are also a great way to access your etextbooks, take notes, and look up information on the fly. Why lug around books, and an ereader, and a laptop, when you can have it all in one small, fast, inexpensive device? Today we are going to talk about the Lenovo Ideapad S10. 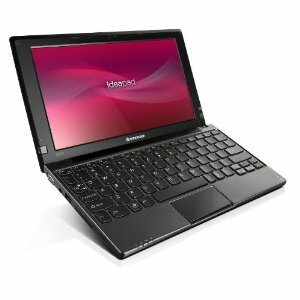 This is a new device from Lenovo and it has some features that make it almost as good as a notebook, but still with the great advantages of a netbook. First off the screen 10.1 inches which is the largest netbook screen, second it has an almost full size keyboard, which is much better than trying to deal with a cramped mini keyboard. Also this netbook comes with Windows 7 starter. Windows 7 has got to be the most full featured netbook operating system available to date. Still you will want to pay the 50$ and upgrade to Windows 7 Home Premium, to really get all you can out of your shiny new netbook. The good news is it is easy to do with Windows Anytime Upgrade. Another upgrade that will make your netbook computing easier and less frustrating is to get a wireless netbook mouse, such as this awesome Logitech Netbook Mouse that comes in cool colors, has a tiny USB plug and only requires one battery. You won’t be sorry you made this purchase. Now on to the features of the Lenovo Ideapad. It has an instant on function which will get you online in seconds. No waiting around for the Internet. It is just over an inch thick and weighs less than 3 pounds. It also comes with a one key rescue system which makes data backup and recovery simple and painless. It also comes with DirectShare which allows you to synchronize your files with another computer without even having to connect to the Internet. It has a long battery life and integrated high-speed Wi-Fi. It has the fast Intel Atom N455 processor and stereo speakers with Dolby surround sound. It comes with a 160GB HDD drive and an integrated web camera and card reader. It also has built in protection against hard drive shocks and it even comes with face recognition if you want to secure your date and log in with your gorgeous face or your ugly mug, whichever the case may be. So you have a super powerful, small, lightweight. Which is full featured and has everything your larger notebook will have except for a dvd drive. Although there are external dvd drives you can use for your netbook if you need to. So what can you do with this awesome netbook? Well you could use it for school and carry around all of your etextbooks and take and read notes on it. You could also use it to get on the Internet and research papers and additional study material. You can also use it for online media such as You Tube and Pandora. You can also chat, video chat, and skype with your friends. I mean business associates and study groups. Of course you can use it for a music player with the awesome speakers and surround sound. Sure you could watch online movies and TV shows too. You could check your email and browse the web. I know you wouldn’t, but you could also play games too. So for less than 300$ plus the couple upgrades I recommend, you could have a bag that weighs less than 3 pounds,that contains all your notes and texts. Plus a communication and multmedia device, a dictionary, thesaurus, and reference guide, not to mention a music and media player, and a game player too, all in one device.